We help your business create a complete Search Engine Optimisation Strategy. Before you can start with your SEO strategy we need to create an analysis of your competition. Align your business strategy with your SEO. Analyse your competition and why they rank higher than you in the search engine. Keyword analysis - what are your keywords? What are your search results compared to your competition? If you are paying for Google Adwords Campaigns, we check at how effectively you rank against your competition. We use several tools to analyse your competition. Link and Backlink Analysis - how are your competition ranking with content on their websites. Google likes websites that have good, quality backlinks to their website from high ranking websites. Particularly articles that answer questions and problems - very relevant to their search queries. If your competitors are doing a better job than you, we measure where you are, what your competitors are doing, and how to get your website ranked above your competition. 2. Assess Where you are! Having completed the competitive analysis, we look at your website and social marketing activities. Many businesses have a website strategy but do not integrate social marketing and social media. Top ranking websites have strategies covering; websites, social media and mobile applications. These must work together to get customers and improve customer satisfaction. Target audience - We will analyse your target audience and create the best keywords and phrases that describe your services and products. Landing Page Analysis - Once your prospective customer lands on your page you must ensure that the content is completely relevant to their search criteria. Link analysis - All links to your site are potentially gold mines. Search engines love to see good quality links back to your content and web pages. Content analysis - Once you have customers coming to your website, ensure that the content on your site is both relevant and interesting. Web design - The overall design of your website must be easy to navigate and relevant to your prospective customers search terms. Social Media Integration - Websites should make it easy for people browsing your site to be able to quickly and easily 'tweet' or social bookmark your article and content. Marketing - Your position in the market place is important for your products and services. Are you in the eCommerce high sales quantity products or perhaps in the services industry - both have different marketing positioning techniques for search engines and website designs. Brand awareness - With the introduction of social networking, mobile applications and community driven websites your brand and brand positioning is critical in order to create awareness in your market - either local or global. Search Engine Optimisation (SEO). Your SEO strategy should cover all areas of your business. ... and many more areas that will all help your website ranking. "Content is King" is so important with SEO! Backlink implementation - If you have a new website or an existing website with little traffic you will need to build up good backlinks. Content creation policy and procedures - Good content takes time to create - especially if the content is targeted at specific audiences and markets. Blog and RSS feed integration - Blogs and RSS feeds offer every business a great opportunity to add regular and dynamic content that other sites will want to link to. Action planning and Company events - All businesses will have events and product / service launches. Events will be planned for launch. Your web marketing strategy must re-inforce your existing marketing strategy. Once your business strategy is aligned with your web strategy it will need to be monitored with metrics. We create a list of goals and objectives at the start of every website project. Objectives list out your goals and aims for web strategy. Once you have your website running you will need to monitor these carefully - especially if you're running an AdWord campaign in conjunction with special promotions and events. There are many ways to market online, for example using Groupon special offers. We install analytics as standard and report these statistics every month. All the analytics are available online with your own dashboard showing how your website performs. 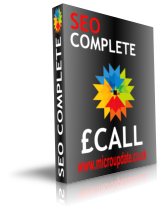 Follow Micro Update Ltd's Search Engine Optimisation (SEO) on Pinterest.